Over the past few years, the world's best entrepreneurs and investors have released highly valuable articles about SaaS startups. Christoph Janz wrote about funding, Neeraj Agrawal wrote about growth, Jason Lemkin wrote about… well, everything. One thing, in particular, makes those readings great: they contain a ton of numbers and metrics that are helpful to understand what a successful startup looks like at each step of the growth journey. So what happens if we put those numbers together in a spreadsheet? Can we paint the big picture of a SaaS startup in Silicon Valley, from inception to IPO? Starting a startup is a long-term game. In 2016, the TTU (time-to-unicorn) was stable at 6 years in the US, courtesy of the good people at fleximize. A unicorn, as originally defined by Aileen Lee of Cowboy Ventures, is a tech company, public or private, that reaches $1 billion in valuation. More recent definitions exclude public companies from the scope for obscure reasons. Regardless, joining the blessing of unicorns remains a big deal, if not the mark of success for most founders. The Australian unicorn is Atlassian (developer tools), the South American one is Decolor (hotel and flight booking). 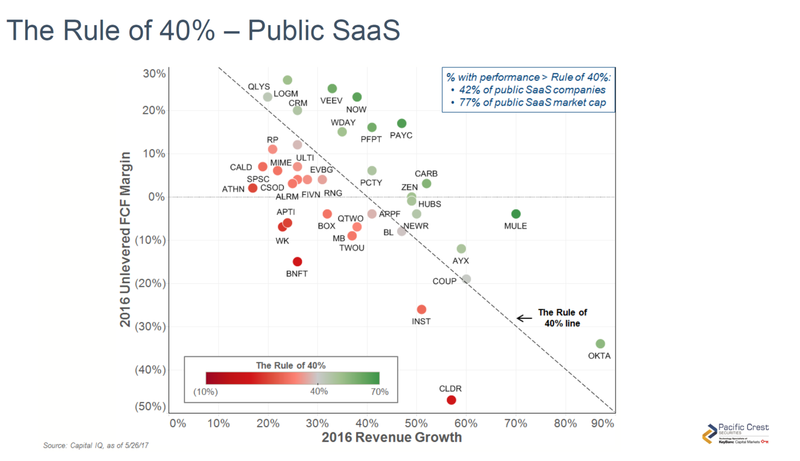 What about SaaS IPOs, then? Data from Pitchbook suggest a median time of 8.2 years between first VC funding and IPO. Throw in an extra 12 months of existence before the first funding round (purely speculative), and we are looking at a TTI (time-to-IPO) of nine years, give or take. So much for the quick buck! 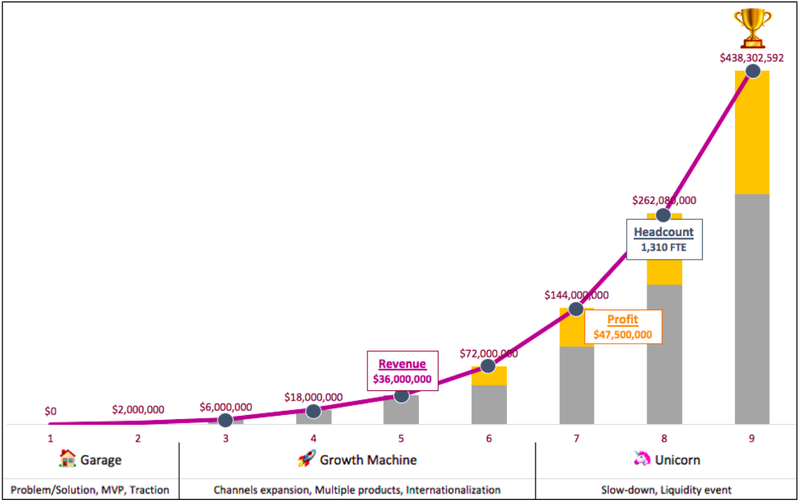 In a 2015 article, Neeraj Agrawal suggested that SaaS growth follows a clear pattern. First, you establish a product market fit. First, you establish product-market fit (PMF) either instantly or within up to two years. Second, you reach $2 million in annual recurring revenue (ARR), which is another one to two years. From there on, things become pretty predictable and Neeraj puts forward the T2D3 rule (i.e. revenue triples twice then doubles thrice in the 5 following years). Bottom line: you should pass the $100 million mark in ARR six to nine years after starting. What about after that? According to Rory Driscoll of Scale Venture Partner, “for a best-in-class SaaS company, the growth rate for any given year is  percent of the growth rate of that same company in the prior year”. Now that’s the top line is clear, let’s look at the bottom line. In the early days, it is safe to assume that the company grosses in little to no profit. 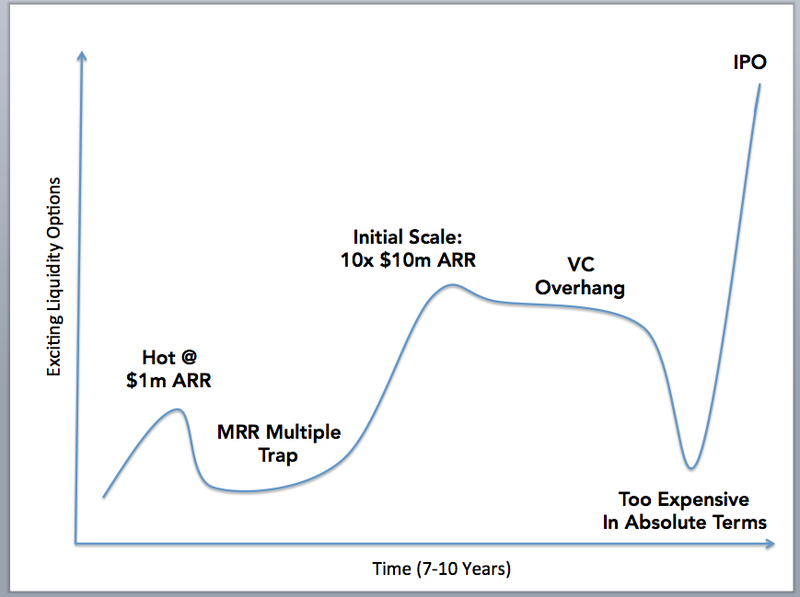 Once you are above $50M ARR, however, things change. In a 2015 article, Brad Feld formulates the 40 percent rule: your growth rate + your profit should add up to 40%. 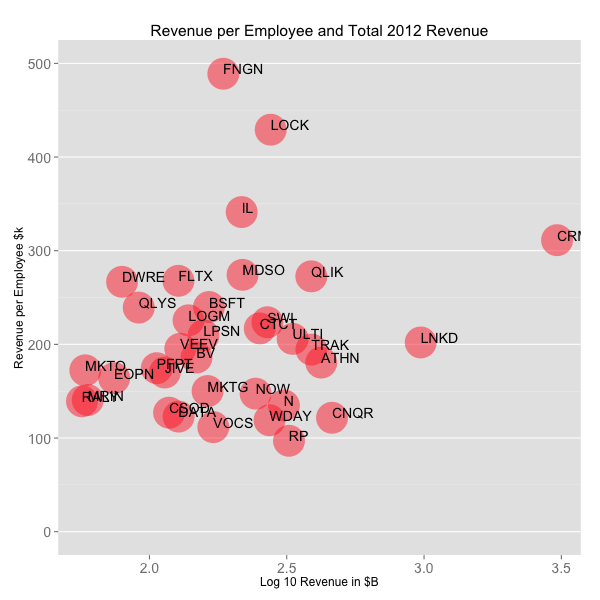 Growing revenue or margins, that's the question. (The graph is originally from Pacific Crest Group, found via this article by Dave Kellog. Kudos to both of them). We will assume that you run your infrastructure in the cloud, so profit = EBITDA. But as Feld points out, reality may be more complex if you run your own infrastructure. 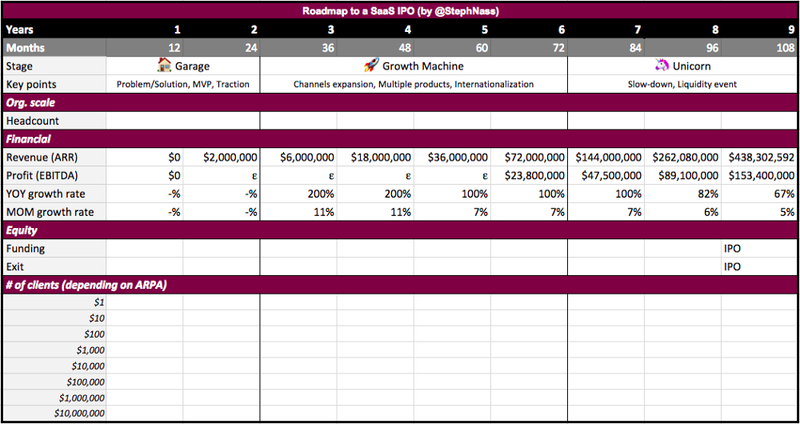 Once you hit ~50M in revenue, your profit should be 40% minus growth rate. This is a cropped version of the napkin, but you should absolutely see the full version — it's a classic. Let’s assume that you raise funds every 18 months for seed, series A and B. After that, things become blurry. Janz also offers typical valuations and round sizes in his article, so you can easily assess whether your $10 million ask for a seed round is realistic (hint — it’s probably not). 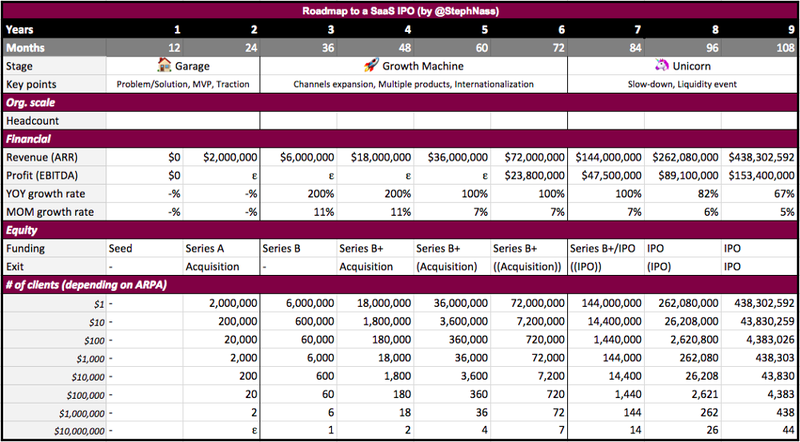 Typically, funding is structured in several rounds (seed, series A, B, C, etc). Then it's time to IPO. As your startup grows, you may be presented with opportunities to sell. Perhaps a competitor with deeper pockets wants to clear up the space — Hired and Match.com are really good at that. Or perhaps a large corporation will see a “strategic fit” with your team, product and/or clients. Think GM with Cruise or Microsoft with Linkedin. Most of the time, it’s both. At $1 million ARR, when you are “hot and cheap”. At $10 million ARR (and decreasing until $100M ARR), when you become meaningful but still affordable. So if you feel like you won’t make it to the next milestone, it may make sense to sell at a local maximum. Or is there an alternative? If you want to go big, you want to IPO. But what makes a SaaS IPO? A successful IPO follows a line that O'Driscoll calls the “Mendoza line”, with ARR on the x-axis and forward growth rate on the y-axis. Assuming that you maintain 82% of last year's growth rate, every year. These numbers are incredibly hard to achieve, and that’s what the author calls “the realistic low bar to IPO”. Unsurprisingly, there has been only 21 tech IPOs per year over the last five years. 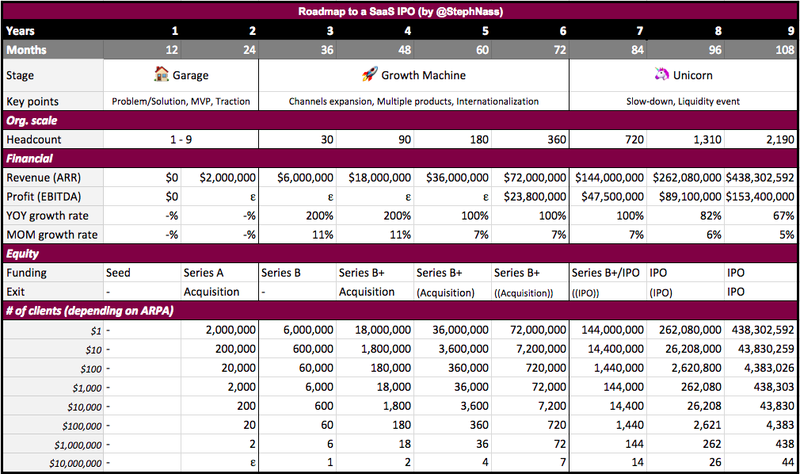 The best opportunities to exit in SaaS are at $1M ARR, $10M ARR and after $100M ARR. To put it in perspective, let’s look at what it means in terms of sales. Our target is $100M ARR. Now, your ARPA (average revenue per account) is a constant by definition. So you can derive the number of clients that you need following Chris Janz’ chart. At $10 million ARPA, you need 10 clients to IPO. At $1 million ARPA, you need 100 clients to IPO. … At $1 ARPA, you need 100 million clients to IPO. Say you address a market of “prosumers”, like Wix, Typeform, Evernote or Mailchimp do. You charge on average $100 per year per customer. Not only do you need 1 million paying customers to IPO, you also need to add 250,000 more customers next year (and/or upsell by as much). 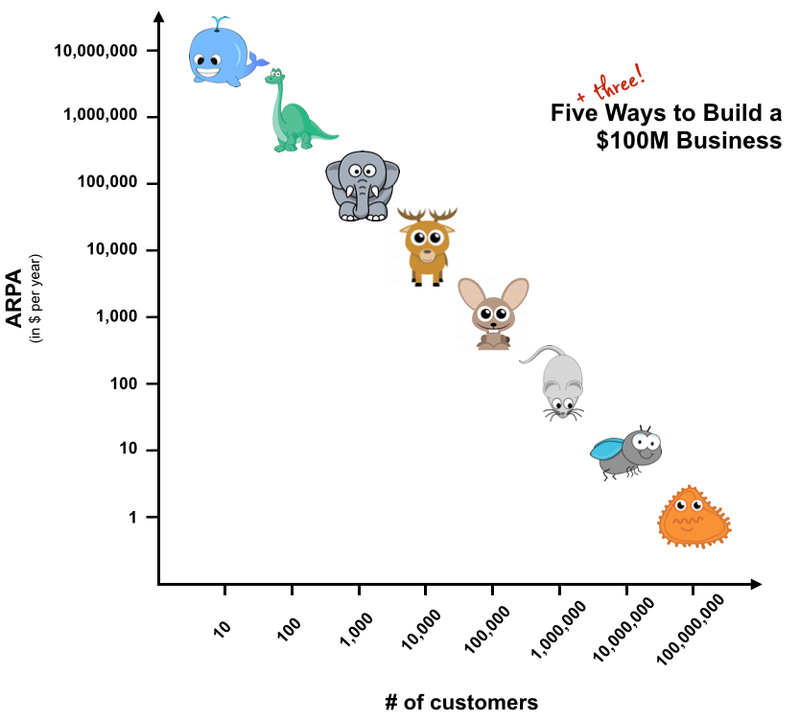 To be a unicorn, you need 100 clients at $1M ARPA or 1M clients at $100 ARPA. Still looks like something feasible? Then let’s look at how much people it takes to build this kind of company. The headcount increases as you move forward through the startup lifecycle. Conveniently enough, Tom Tunguz from Redpoint has already done the math for us. 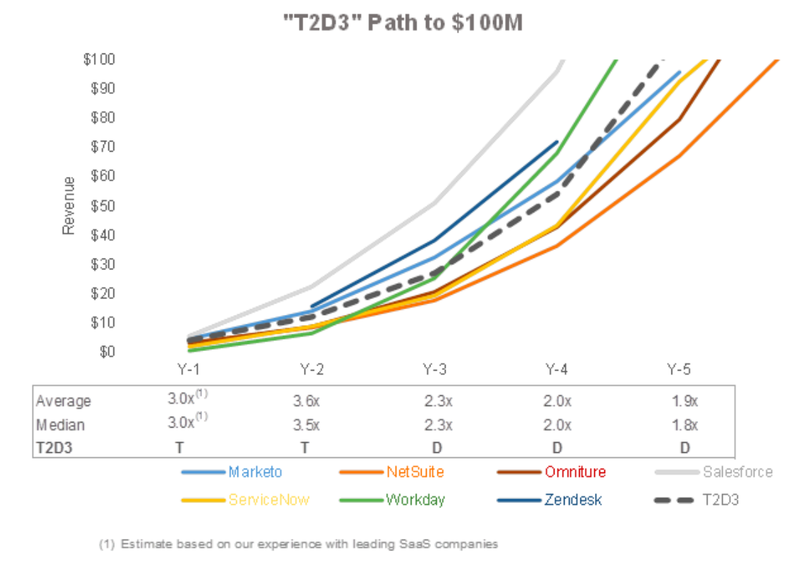 In SaaS companies at scale, the average revenue per employee stands at $200,000. True, this is for 2012 and this if for companies at scale. If you have better numbers, hit me up and I’ll update them! 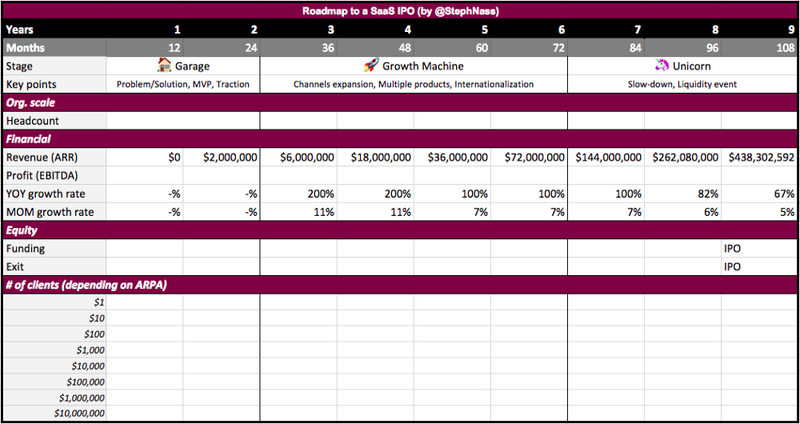 At the end of the day, that is what our roadmap to a SaaS IPO looks like. Yes, it's the the same picture as at the beginning. Keep in mind that this is “unicorning your way to $100M ARR” i.e. it’s the (supposedly) perfect trajectory. Obviously, it’s a super wide generalization. 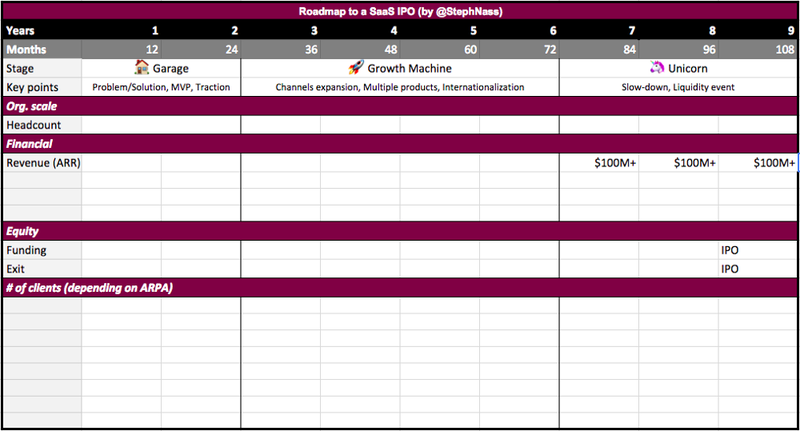 Not one startup will follow this roadmap strictly, and counterexamples abound. But frameworks are useful, and hopefully this one will be useful too. We hope that you enjoyed this reading. If so, hold the 👏 button and give it 50 claps! To read more, you can also check out this article presenting 9 methods for startup valuation. Insights from PARISOMA’s network and corporate innovation’s best practices, straight from SoMa.